These vintage turquoise leather sandals are by Penaljo. The front has four straps that cross in the center. The slingback straps have a gold-tone buckle. 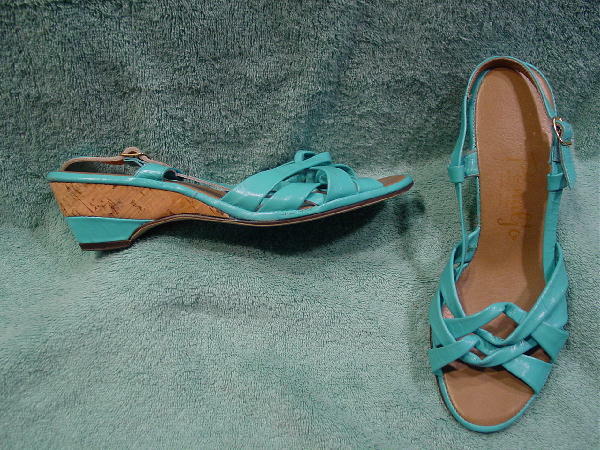 Below the footbed sides and back is a cork area and below that a turquoise heel. The right shoe back of the outer turquoise edging has a small scrape. 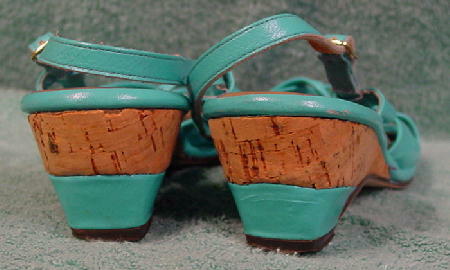 The left shoe back cork area has a small ding as it meets the upper turquoise edging. The tip of the soles is worn down a bit. The right shoe has some little dark marks on the outer ball and a light maize color mark on an outer strap. She hasn't worn them in decades. The heels are probably brittle and will have to be replaced. Since gaining weight she wears a much larger size.